Cryptopay FAQ: Como comprar bitcoins rapidamente? - How do I get started with Cryptopay? Todas as categorias › Começando › How do I get started with Cryptopay? To start using Cryptopay’s services, you need to register an account first. You can do so by clicking Sign up button in the upper right corner; or, alternatively, leave your email in the field on the main page and click Sign up now. 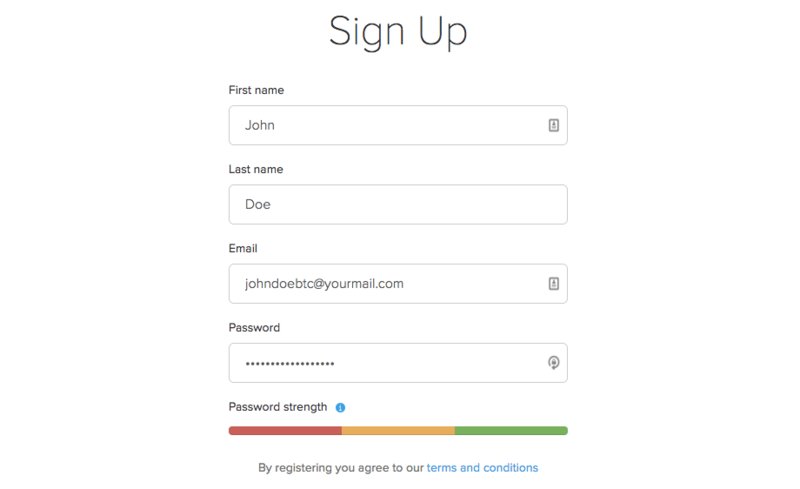 Fill in your personal details, come up with a strong password to protect your account, and click Sign up to continue. We will send you a letter with your confirmation link shortly after. You can easily find the letter in your inbox. Click the link to confirm your registration. Once you have signed up with Cryptopay, you will be automatically assigned seven separate wallets for each supported currency: BTC, ETH, LTC, XRP, USD, GBP, and EUR. That is it! Congratulations, you have created an account with us and can freely use our services. Use your email and password to log in anytime.